Great for school, home, or office decorating! Total of 234' of border trim per pack! 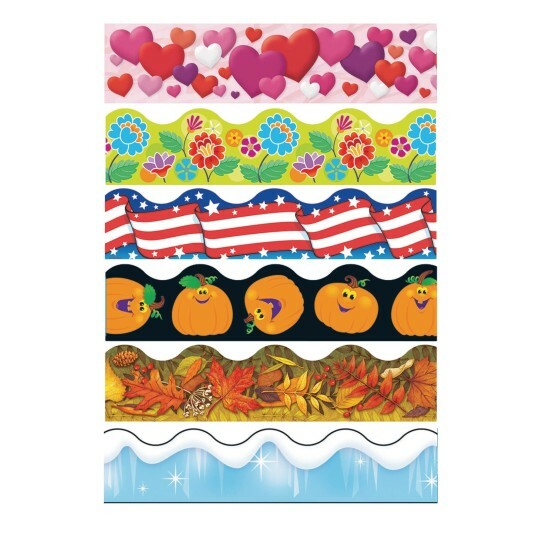 Decorate your bulletin boards, reception desks and windows with these festive border trims. Pack of 6 trims include Party Hearts, Floral Garden, Americana, Pumpkin Pals, Autumn Leaves, and Winter Fun. Each of the 6 designs is made up of twelve 2-1/4" x 39" panels for a total of 39' per design and 234' of border trim per pack of 6.